Down in south, the malayalam film industry is blessed with creative technicians and actors who are ready to give their soul for the betterment of each project to which they are associated. As the industry give due respect to those who do carry real passion over their filmy career, young talents are getting recognition in their own field. The year 2013 which opened with a breezy smile has proved to be good for the malayalam filmmakers. The arrival of passionate youngsters to the fascinating world of entertainment should be truly encouraged. After being closely associated directing 5 albums, Devakumar is gearing up to make his silver screen debut electrifying with a socially committed theme. Young filmmaker Devakumar is in cloud nine as his big screen directorial debut 'Signal' is waiting to hit theatres soon. In an exclusive chat with SpiderKerala, Devakumar shared his thoughts about the movie. "My movie 'Signal' is a campus movie which is packed with suspense and thrills. More than a campus oriented theme, the ultimate aim is to connect it is closely connected with the society focusing on a socially relevant subject which gives thought provocative messages to parents and teenagers. As the parents do give much preference to their profession than their family, less care is given to their children. Working abroad concentrating more on making money, parents does not take time to think about the mental and emotional changes which happen in their children". says the director. "Giving extra freedom and negligence would bring jeopardy in the life of teenagers. 'Signal' pools into the trashy nature of our present youth caused by the irregularity in the life of parents. Flavoured with components needed for a commercial movie, Signal would shed light towards the future society where there will be incredible relationship between parents and their children." added Devakumar. Devakumar who has completed diploma in film making from Chennai is ready with his first venture. Keeping his movie fervent friends close to heart, this young man is looking forward to get the result for the dedicated for the making of the movie. 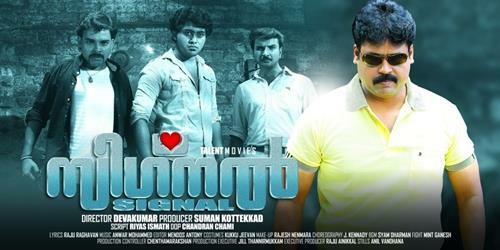 Devakumar would be introducing a long line of fresh faces along with popular actors in Signal. The cast include Shakthi, Ramis Raja, Vidyasree, Adhithya, Sivaji Guruvayur, Sasi Kalinga, Lishoyi, Biju Chalakudy, Nanda Kishore, Jeevan, Haridas, Suhail, Sunil Surya, Nandu, Ambika Mohan, Vandhana a, Ancy and Ajanda. Signal will be blessed by the Riyaz who had done the scripting of the movie. For the lyrics of Raju Raghavan, the tunes have been set by Anwer Mohammed. The movie produced by Suman Kottekkad under the banner of Talent Movies. 'Chendumalli' from the movie sung by Franco, Pradeep Palluruthy and Jyolsana was released on You Tube. With the post production works over, this movie would reach theatres in the third week of May. So be prepared to enjoy a campus film which would truly entertain you.